The one place in Canada where no one argues about climate change is the North. This is because the effects are so obvious and dramatic (PDF) you'd have to blind not to notice them. This is not to be confused with the willful blindness of the many deniers of anthropogenic climate change that can be found in the more southerly regions of Canada. It's one of the reasons for the current geopolitical gold rush that is taking place between the four polar nations. The signs are so apparent that even Stephen Harper is forced to mention while visiting in the region. You've got to give it him, only our Prime Minister could spend a week in an area so obviously affected by climate change and, as Jeffrey Simpson of the Globe and Mail says, rather than using the occasion to speak to his fellow citizens about what’s happening and what we should do about it, he mentions “climate change” in passing, then moves on to another subject or military announcements. 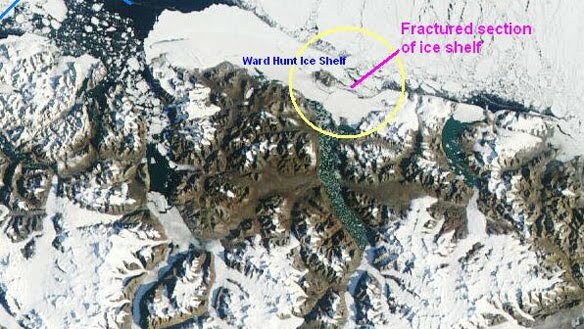 It was probably hard not to notice giant tracts of Arctic ice have been calving off ancient glaciers and ice shelves recently, including just last week when a twelve story thick piece of ice, estimated to be between 3,000 and 5,000 years old fell off of Ellesmere Island -- part of Canada's largest remaining ice sheet. Sea ice, as Harper has probably been informed (that's what the PMO staff is for right?) is a very important part of the climate system, ...affects surface reflectivity, ocean currents, cloudiness, humidity, and the exchange of heat and moisture at the ocean’s surface. Open ocean water is darker in color than sea ice, which causes it to absorb more of the Sun’s heat, which increases the warming of the water even more. But that doesn't mean he has to talk about it, much. It's like mentioning religion or politics at a dinner party, and who would do a thing like that? Not our Stephen!